There are three cards in the package, together with assembly instructions. 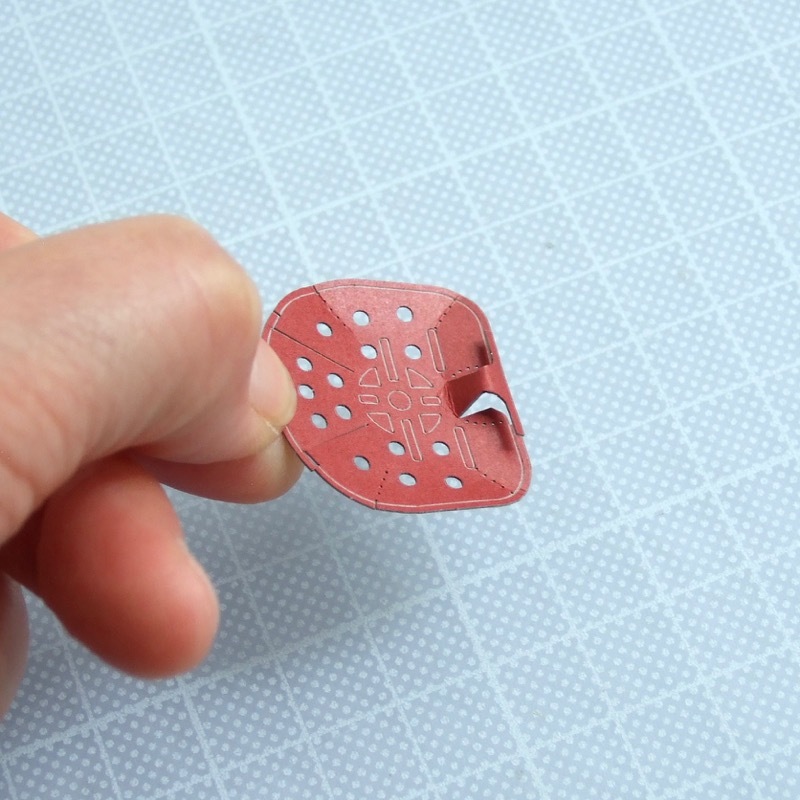 Detach all parts of the chair from the second card, using a craft knife/scalpel – connections are indicated by little triangles. Apply glue in between, attach together and place the part in the profile slot in the card until it dries and the shape is fixed. Carefully shape the seat into ‘pressed tractor seat’ contours – firstly gently form ‘valley folding’ for radiating dotted lines. Then fold up and down the front centre of the seat, until the tongues are meeting the rim. It is best to use tweezers to make two valley folds at the front of seat, as they are small and the folding lines are curved. Glue the back of the seat first. Apply glue where overlapped, both to rim and the seat, then hold the gluing area against a hard surface and wait for the glue to set. The front is similar – place tongues under the front rim, apply glue to the overlapped areas and hold it in shape until dried. When leg part is dry, attach wooden coloured layers on the bottom and the top. Apply glue to small area at the top of the leg. 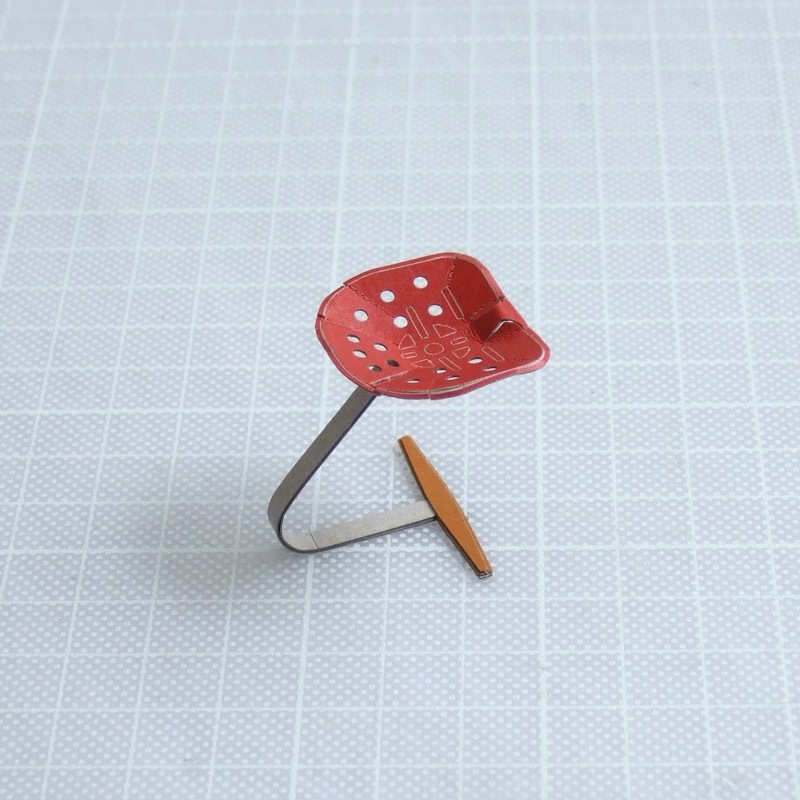 Place the seat – align centre of small circle on seat with the wing nut. Check top view for the mirror balance of the seat and the leg and correct it if necessary before it dries. Now the stool is complete! Next step is the wall stencil decoration as in the Castiglioni brothers’ 1957 installation. Use the stencil template on the leftover card and sharp coloured pencils – originally Yellow, Green and Red. Place corner of template to the point where blue arrow shows, then stencil patterns and fill with colour as in the following images, repeat with all 3 colours and recreate the atmosphere of the original installation. For assembling wall and floor together, please refer to How to assemble background link. When you place the stool in the room, your diorama is completed.